I love old horror flicks and 50's era B Movies. So, i decided to create my a Bride of Frankenstein costume. I added dreads to my hair to make it large and used white clip-ins to create the white streaks. I created bolts from ear plugs by cutting and painting them and used spirit glue to glue them to my temples. the clothing was purchased from various online sites. 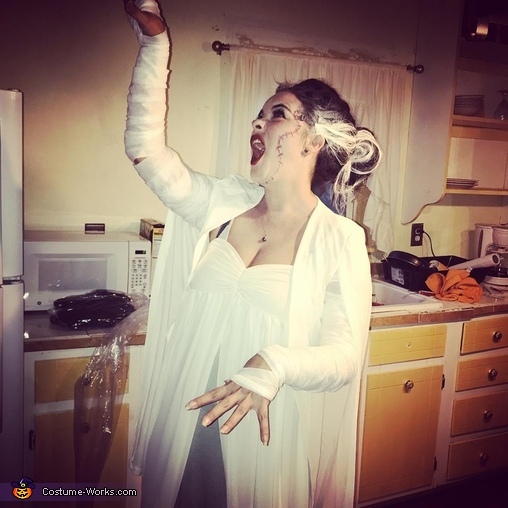 I then wrapped my arms in medical gauze to simulate the dressing that appear in the original "Bride of Frankenstein" movie. Used standard make-up to lighten my complexion. Using lip liner pencils and eye shadow i drew/painted in the scar and stitching to my face.